The Surfacing Company Ltd is proud to announce that we have received our Mastertint approved contractor certificate from Lafarge Tarmac. 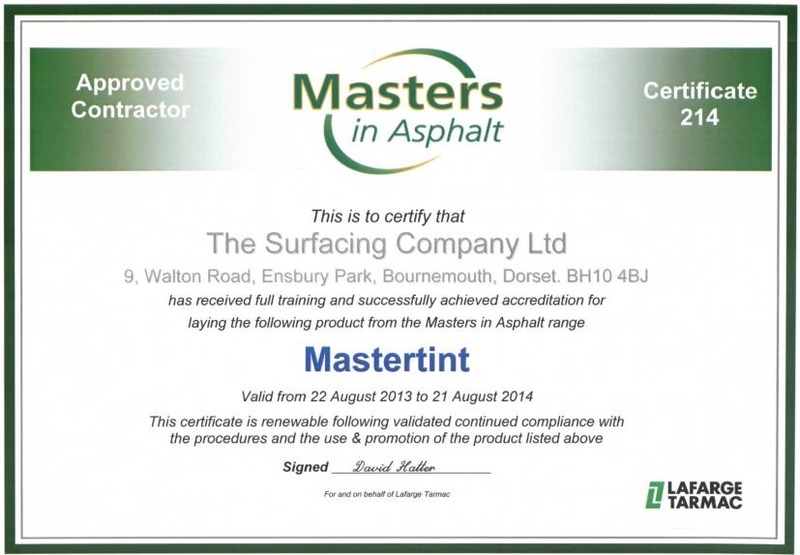 This accreditation means that The Surfacing Company Ltd has received full training and accreditation for Laying Mastertint products. Mastertint is a coloured asphalt range that can be both beautiful and practical. Mastertint is perfect for smooth surfaces as it is a material that is resistant to wear and tear. Mastertint replaces the surface course of a pavement construction. It has all of the structural qualities of the surface course but can be supplied in a variety of different colours. It is made from coloured aggregate mixed with a pigmented binder and is therefore not a coating or another layer that will wear or flake off. Mastertint must be installed by a Mastertint approved contractor. Should you need an approved contractor please contact us on 01202 240375. Mastertint coloured asphalt has a huge range of applications and can be used on roads, car parks and thanks to its smooth, safe surface, it is also the perfect solution for all pedestrian zones. Suitable for all light traffic car parks, from retail centres, supermarkets where health and safety benefits customers when wheeling trolleys over smooth asphalt surfaces versus block-paved areas.